While many silver screen stars opt to change their odd monikers to something more cinematic, or at least pronounceable, the Cotswolds have retained their eccentric appellation in true Benedict Cumberbatch style. Chris Dee, a local resident whom I befriended on my first visit to the Cotswolds years ago, believes the name roughly translates as “sheep on the hill.” Given the number of bleating denizens grazing around every bend, that would certainly be apt. 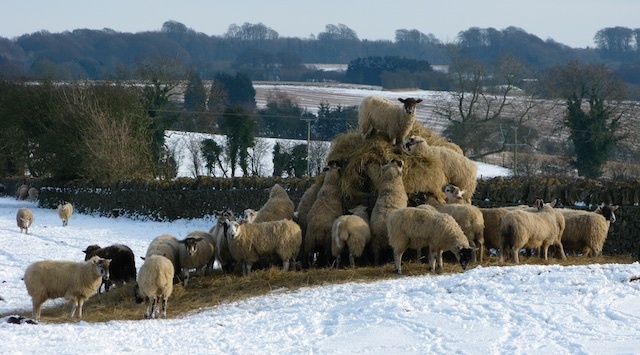 Is the term “Cotswolds” an ancient reference to sheep? Ewe decide. Others say it derives from a Saxon farmer named Cod. No one really knows, but everyone has an opinion. Needing very little incentive to visit a pub for any reason, I put Dee’s theory to the test in Broadway, a village named for the wide, welcoming High Street. 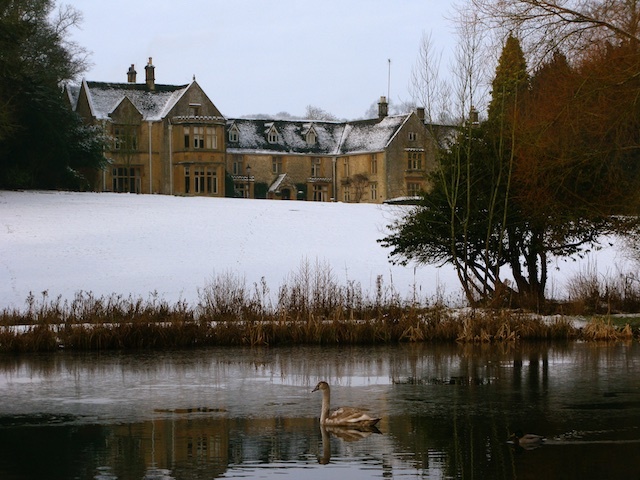 At The Swan, the rounds are flowing freely, and the fellows bellied up to the bar are happy to expound on the meaning of “Cotswolds,” and much else besides. “A wold was a stone enclosure, where they used to keep the sheep,” offers one Broadway native, while his mate has always reckoned “wold” is a derivation of “walled” — a reasonable theory, considering the countless miles of dry stacked walls that demarcate fields throughout the area. As the pints evaporate, the conversation ping-pongs to politics, the monarchy, and to the obvious appeal of the Cotswolds. “It’s the fresh air, innit?” observes another affable gent, having just stamped in from the cold. A woman walks her dog along Broadway’s main street. 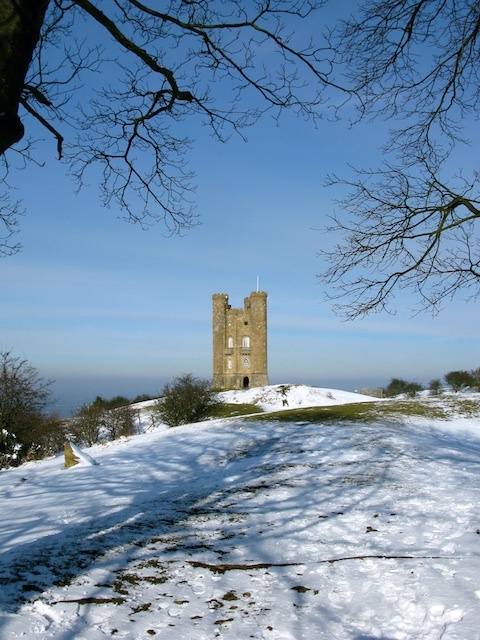 By the time I take my leave, I have not only a head full of theories, but a notebook filled with places my new friends suggest I explore, beginning with nearby Broadway Tower. The sixth Earl of Coventry commissioned the turreted tower, completed in 1799, as a gift for his wife. “She didn’t have the internet or TV, so her total enjoyment was looking out her window at Broadway Tower,” explains Neil Thorne, who greets visitors on the day of my visit. 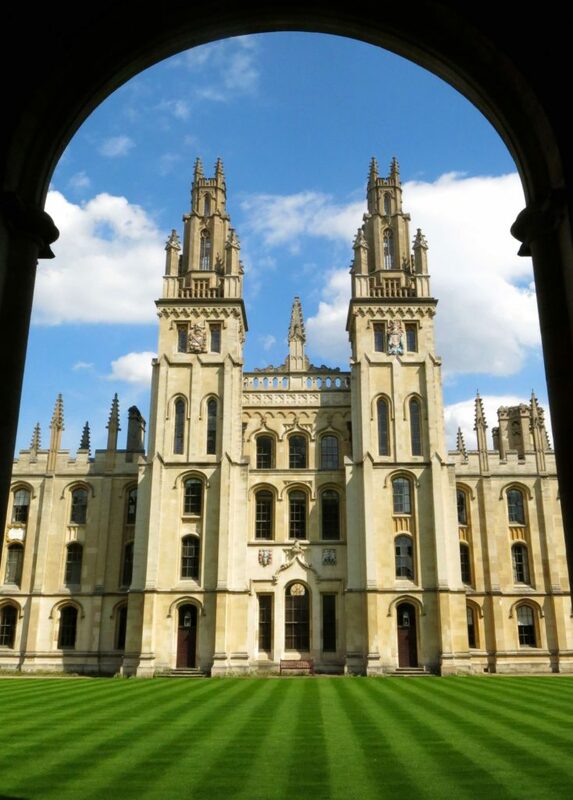 “Today, people come for three reasons: its connection to William Morris (the 19th century English architect and designer who was a frequent visitor), the views, and…because it’s there,” he concludes with a cheeky grin. 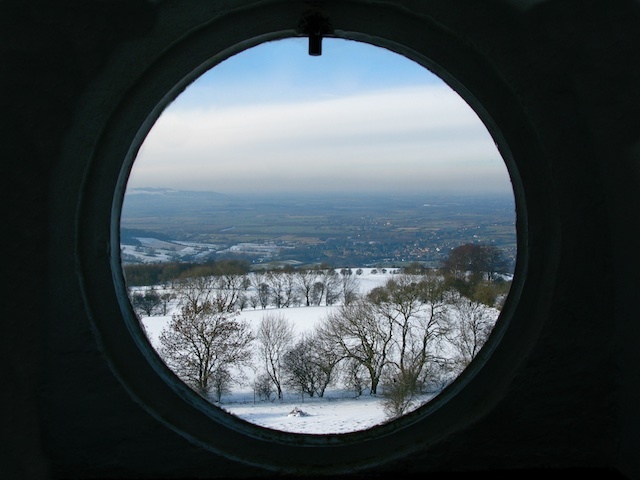 If the winding stairs to the top don’t take your breath away, then the picturesque panorama from the second highest point in the Cotswolds surely will. 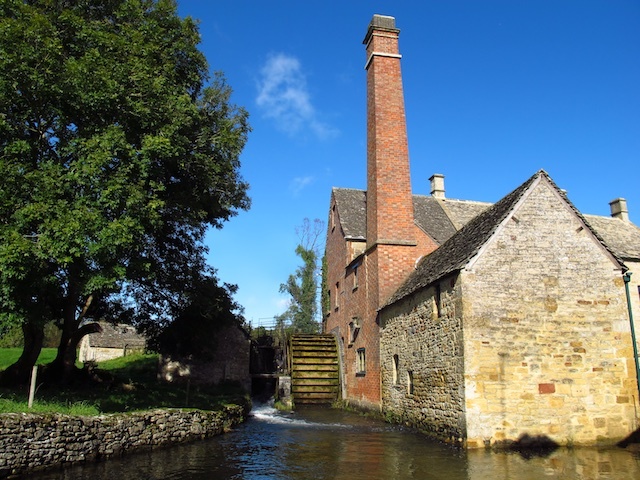 Far below, a few hearty hikers, bundled to their eyeballs, trek along the Cotswold Way, which extends from nearby Chipping Campden all the way to Bath. Half a dozen red deer lounge around an icy watering hole, and white fields give way to greener pastures as my eyes strain toward the horizon. A climb like that whets the appetite, and the Cotswolds boast a commendable range of culinary options. Tuck into hearty fare like a hangar steak with bone marrow butter or a Cornish mackerel burger at The Kingham Plough in Chipping Campden. With chef proprietor Emily Watkins (former sous-chef at Hestor Blumenthal’s The Fat Duck) at the helm, patrons expect more than the usual pub grub. 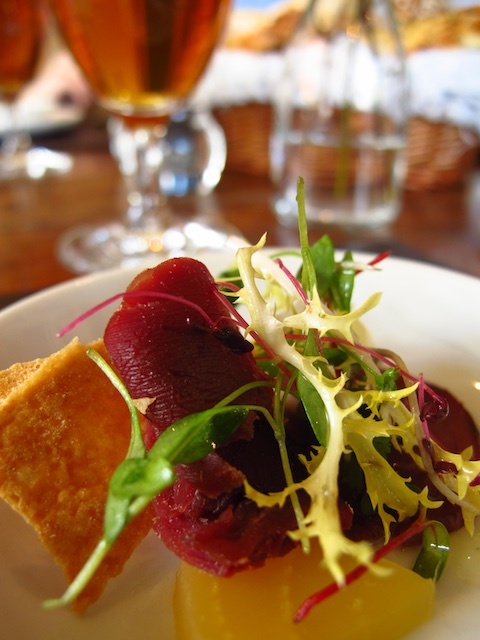 Foodies will also be tickled by the creative menus at The Feathered Nest in Nether Westcote, where you can dine on exotic dishes such as fallow deer served with burdock, crosne, blackcurrant gin and Douglas fir, or calf’s sweetbread with white asparagus and scarlet elf cup. (No, I have no idea what that is, either). If you’re a fan of “free,” as in gluten-free, dairy-free, and meat-free (whether vegetarian or vegan), don’t miss Daylesford Organic in Daylesford, Gloucestershire. This collection of converted farm buildings embraces an organic restaurant that should satisfy the most conscientious diners, as well as a gourmet grocery (think organic ginger curds, aged fig vinegar, and fresh-baked wheat free almond cake). There’s also a butcher, bakery, creamery, spa, and several shops, where you might find anything from a semi-petrified Acacia tree stump for £1900 (yes, with two zeroes) to a simple white pleated dress, reduced from £895 to the bargain basement price of £268—although I reckon celebrity customers like Kate Winslet probably aren’t holding out for end-of-season sales. Still have a few lonely coins jingling in your pockets? 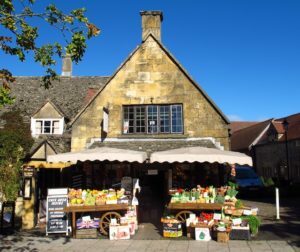 The Cotswolds are famous for antique shops, many of which have particular specialties, like sporting collectibles or farmhouse tables. Christopher Clarke Antiques in Stow-on-the-Wold sells 18th and 18th century military campaign furniture and travel equipment. Each of these antiques, which range from folding bookcases to upholstered armchairs, was built to be easily disassembled and transported, long before IKEA was a gleam in a Swede’s eye. According to Sean Clarke, whose father founded the shop in 1962, campaign chests are particularly popular for children’s bedrooms. “Something which has survived wars is hopefully going to survive a 14-year-old,” he observes wryly. The British monarchy has also endured centuries of turmoil, but Prince Charles and Camilla, the Duchess of Cornwall, have found a rural respite from royal demands at Highgrove House, their private home in Tetbury. 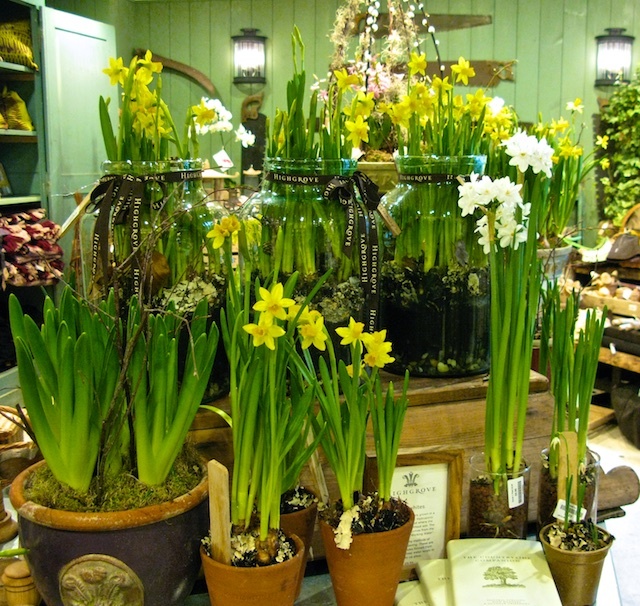 You can tour the gardens from April through October, provided you book ahead, but you don’t need an appointment to visit the Estate Shop. Everything within the store reflects the Prince of Wales’s passions, such as recycling and creating work to help female Afghan refugees support themselves. Wares include limited edition lithographs of paintings by the Prince, baskets woven with wicker from the estate, and accessories made from an exclusive Highgrove Check fabric. All profits go to The Prince of Wales’s Charitable Foundation, so don’t imagine the prince is lining his own pockets with coins emblazoned with his mother’s regal profile. The village of Lower Slaughter, not to be confused with Upper Slaughter. Both, you’ll be relieved to hear, are much more hospitable than they sound. 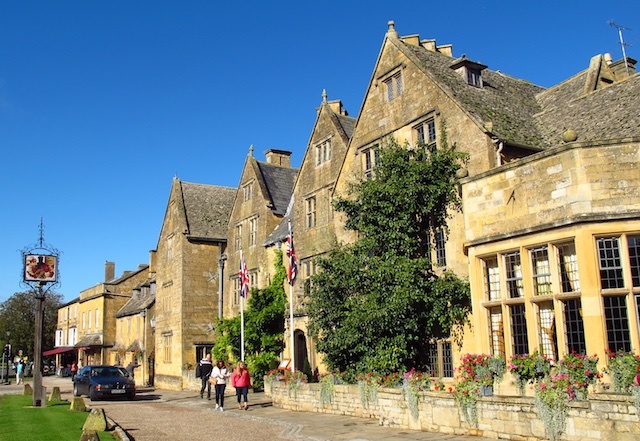 Britain, like the monarchy itself, is renowned for its resilience, and the Cotswolds are the embodiment of the classic English motto “Keep Calm and Carry On.” Many of its villages remain remarkably unchanged since the first stones were stacked centuries ago. In Upper Slaughter, where I spend one evening, the only business I notice amid the quiet maze of homes is The Lords of the Manor, a 26-room hotel originally built as a rectory in 1649. “There can be no pleasure before death,” prophesies a Latin inscription above the door. Fortunately, the hotel management embraces a less puritanical policy. Not only can you indulge in decadent Michelin-starred dining at its restaurant, but you can wash down your five-course feast with a bottle of £1,900 Chateau Latour. A meal fit for a king? Better. Even the silver screen’s red-carpet royalty wouldn’t turn up their perfectly sculpted noses at that. 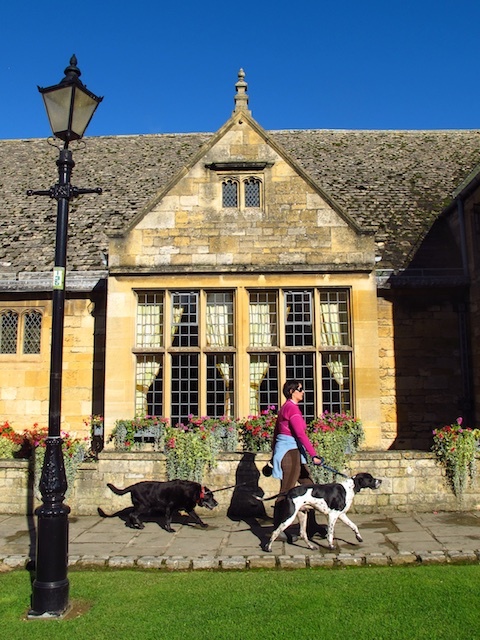 The Lords of the Manor, Upper Slaughter. 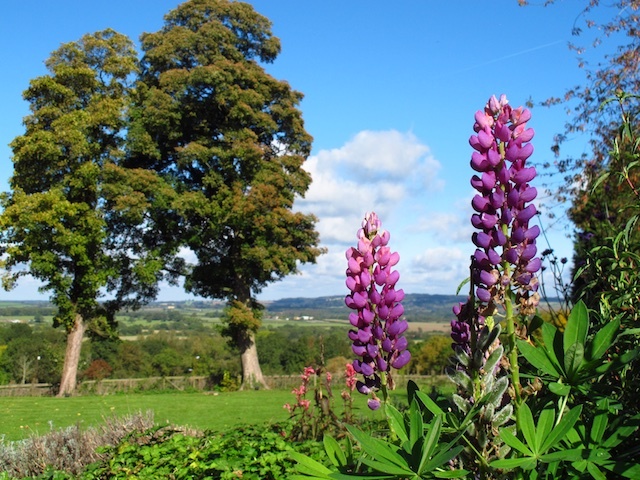 Enjoying its elegant drawing rooms, Michelin-starred cuisine, and peaceful walled garden, you’ll feel like a guest in a friend’s country home. A very rich friend’s home. Ellenborough Park, Cheltenham. Impossibly romantic and atmospheric, this 15th century estate has all the charm of an historic house, updated with 21st century amenities, including a spa and an outdoor heated swimming pool. Cotswold House and Spa, Chipping Campden. When Johnny Depp filmed The Libertine, he bunked here, in the heart of one of the Cotswold’s most beautiful villages. The Manor House Hotel, Moreton-in-Marsh. This 16th century manor features a bar, brasserie, and fine-dining restaurant, but my favorite way to spend an evening is beside a wood-burning fireplace in the lounge, with a glass of whisky in hand and a stranger’s borrowed dog at my feet. 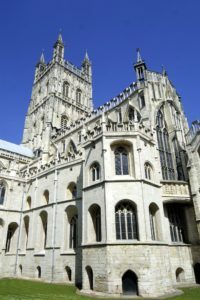 BritMovie Tours: Offers a selection of movie and television-themed tours around the UK, including several around the Cotswolds.